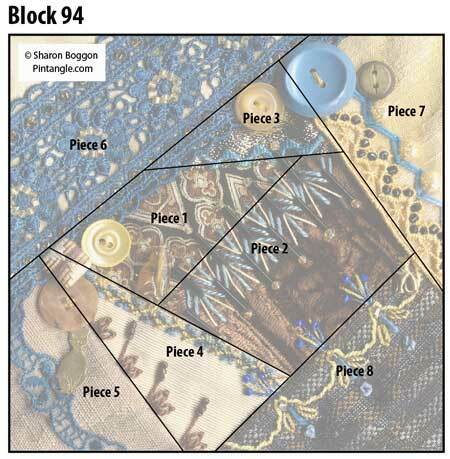 Crazy quilt block 94 has a different colour scheme – or a different scheme what I normally use. As regular readers know when I made my I Dropped the Button Box Quilt I pulled everything on the quilt from my stash. Not only did everything come from my stash this quilt is Y2k quilt so another challenge was to use 2001 unique pieces of fabric, lace, braids, charms, buttons or ribbons as it is a Y2K quilt. 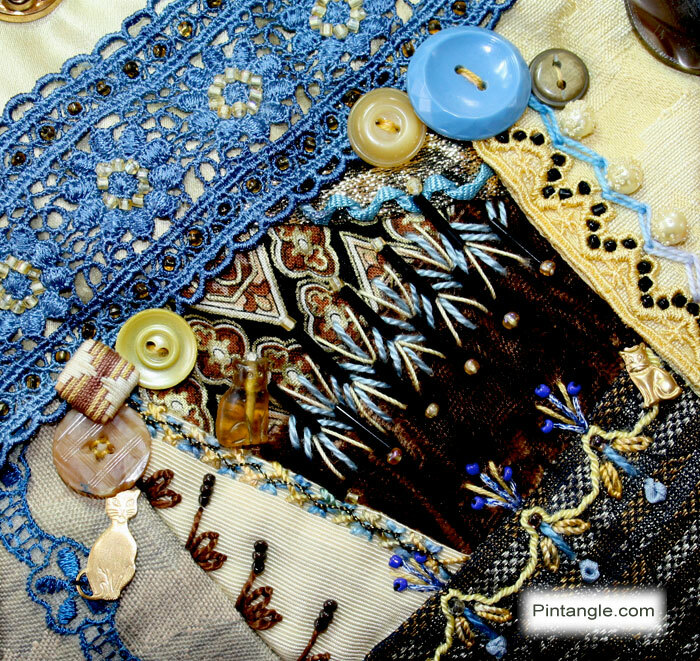 It lead to some challenging moments and I learn a lot about Crazy Quilting by making it! Umm.. dont ask me why I have three cat charms on it as I dont remember. As usual you can click on the photo to see a larger version of the block. On this seam I whipped a line of back stitch that I had worked in scallops. 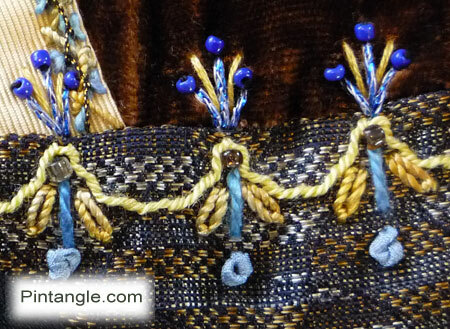 Then I decorated it further with straight stitches and detached chain stitch finished off with seed beads. 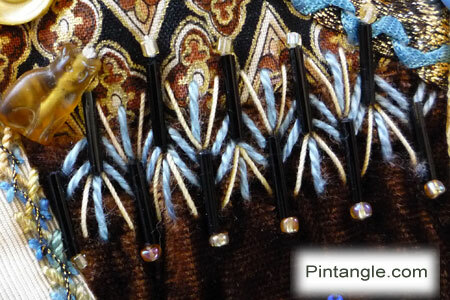 In the case of this seam I adapted arrowhead stitch to work it around bugle beads. The lace on this seam is hand dyed. After attaching it to the block I decorated it with seed beads. 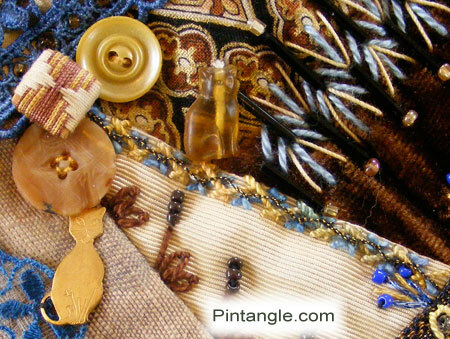 This is triple Herringbone worked in three types of thread. 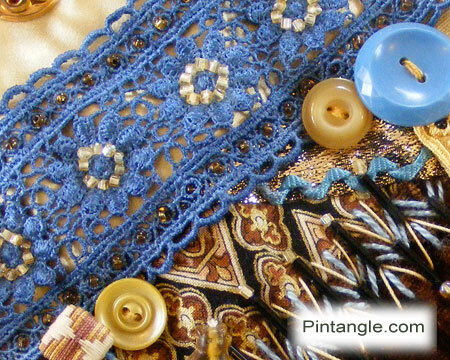 The pale blue is cotton Perle #5. the pale yellow os silk and the last line is a thread spun with twist of metallic gold. It is produced by DMC, sold on reel and called Antique gold. 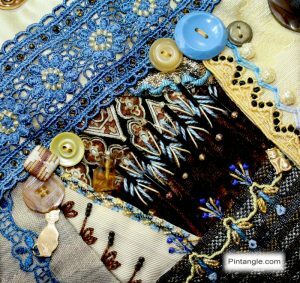 The last detail I have to share with you is a strip of lace that I decorated with black seed beads then added a line of zig-zag chain stitch using an hand dyed cotton thread. 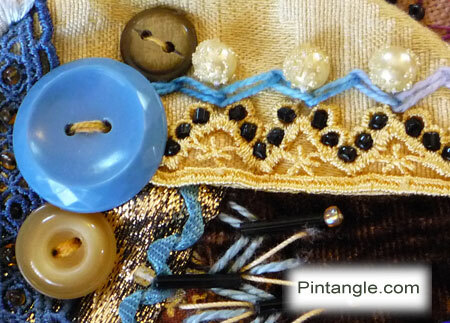 Then I added a line of yellow vintage beads. The buttons are also vintage. Just ran across you. 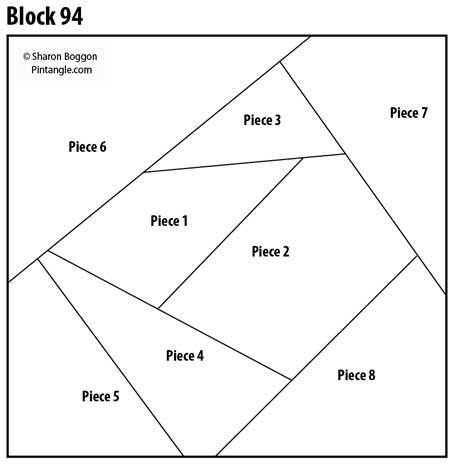 How beautiful…wondering where I should begin…go back and find block number 1? Is this the actual size block (pattern)? what size blocks do you prefer or usually make? Thanks in advance.